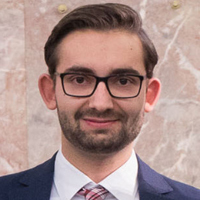 Studying the Bachelor in Business Administration at Frankfurt School, Martin graduated in September 2016. He is a postgraduate student of entrepreneurship at Nottingham Trent University and will shorty progress to a PhD. Many start-ups fail before making a significant contribution to the economy for reasons including the high degree of uncertainty, a lack of planning, a lack of operational experience as well as a lack of resources and their effective management. Management control systems can help start-ups to grow by supplying managers and entrepreneurs with information as well as by focussing their attention. By contributing to managing uncertainty, they are a major factor in growth management. Launching a company with no control systems in place, start-ups introduce these only reluctantly. While their costs might outweigh their benefit in early growth stages, growth requires a suitable infrastructure. During the inception and survival stage, informal control systems are dominant. In the inceptions stage, when the product is developed, cultural control can be used to keep team members motivated when working towards common goals. When the firm looks for its first customers in the survival stage, it does not need any formal sales controls, because the first customers tend to be very similar to the entrepreneurs. In both stages, formal control systems are only introduced if they are required by stakeholders such as investors demanding planning in form of a business plan or financial controls. Once the technical and economic feasibility has been proven in the first two stages, start-ups enter the stabilisation stage where they streamline their operations. Here, administrative and cultural controls are often formalised. Experts join the team to optimise processes, who require a clear task description and often look for professional hiring practices. To keep them working towards the firm’s goals, mission, vision and value statements are normally formalised. When processes are stable and profitable, start-ups begin to plan their expansion in the growth orientation stage. This requires the formalisation of planning systems and incentivising employees to achieve their goals. Moreover, knowledge of the entrepreneurs and early employees is often codified and new employees are trained accordingly. Executing growth plans in the rapid growth stage, the firm makes extensive use of formal cybernetic control, i.e. measuring its progress towards achieving goals. Due to the high uncertainty, management control systems are used to the largest and most formal extend in the expansion stage. When the firms is considered “established” in the maturity stage, uncertainty is reduced and control systems are consolidated. 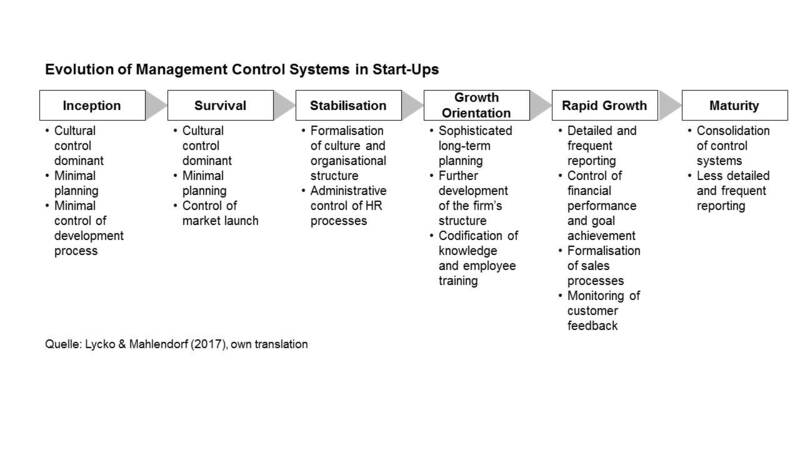 For further information [in German], please refer to our paper “Management-Control-Systeme in Start-ups” published in the Controlling & Management Review.